NEXT MEETING: December 6th, 2003 at 6:30 pm we will get together with members and guests at the Diamond River restaurant in Findlay, Ohio for the annual holiday night out. Diamond River is located on SR 224 on the east side of Findlay. It is across the road from the Meijer store. We have met there in the past years and I believe nobody went home hungry. Please call Bob Torbet (419) 227-3305 to confirm the number of people that you will bring. We will not be meeting on the 3rd at Jack's house, which is our normal meeting schedule. The November meeting was held at Jack Putnam's shop in Bluffton. Bob Torbet led the short meeting with 13 members and friends in attendance. The treasurers report was read and approved. Dues are being collected for 2004 at this time. Melvin brought in his coil tester to check out the wiring. There has been a renewed interest in testing coils with the original magneto tester, as opposed to the spark boxes that can be found at most flee markets. It seems that the build up and breakdown of the magnetic fields that occur when the permanent magnets fly past the field coils are a big part of how the Model T firing takes place. As always, we are looking for winter projects to get as many T's as possible back on the road this spring. We can either work in your garage or take it to Jack's. We have performed some rather major repairs in the past within a couple of day's. If you are venturing into a major overhaul, start early this fall. Once again, Dennis Russell came to the rescue to provide full power to our meeting place. We can all learn a little somthing from Jack's dilemmas with his power connections. Don't use aluminum connections. They corrode and insulate themselves over time. Many thanks to the Putnams for providing a place for our monthly meetings. They always have great refreshments and a clean place to call home for a couple of hours. hand look at how the bodies and wood are assembled under the upholstery. See them at the January meeting. 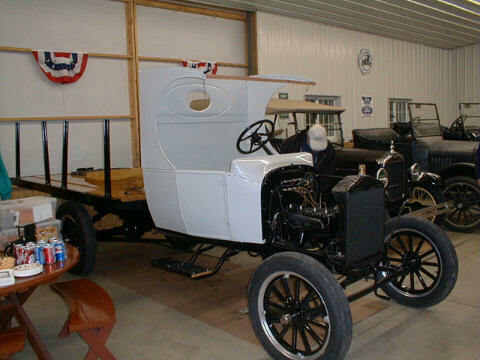 Contrary to popular belief, not all of our projects are Model T's. Other projects involve some older and newer models. On occasion we have even worked on "Model A's". 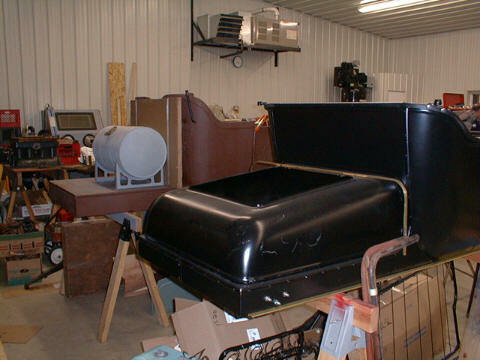 This photo show a 1906 Maxwell that is in the early stages of restoration just sout of Tiffin, Ohio. You wouldn't believe it by looking at it; but, this little two cylinder really runs. It will start on the first pull. A condenser was added to help even out the spark. We are fortunate in Ohio to live relatively close to some very good restoration sources. These fenders were made for $500 a piece and the wheels are being re-spoked for about $125 a piece. Many of the parts have been recast from the original parts and will be machined to perform just like new. The availability of Model T parts is a real plus for those of us that prefer to stay with a higher production car. 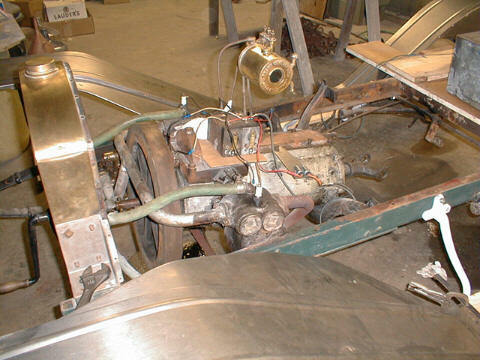 Very few Model T parts need to be made from scratch; although, that is always an option. Is a Minivacation to New England in Your Winter Plan? While you sit around talking at the Christmas party, why not find out a few of the details and give a thought to some winter Model T fun. 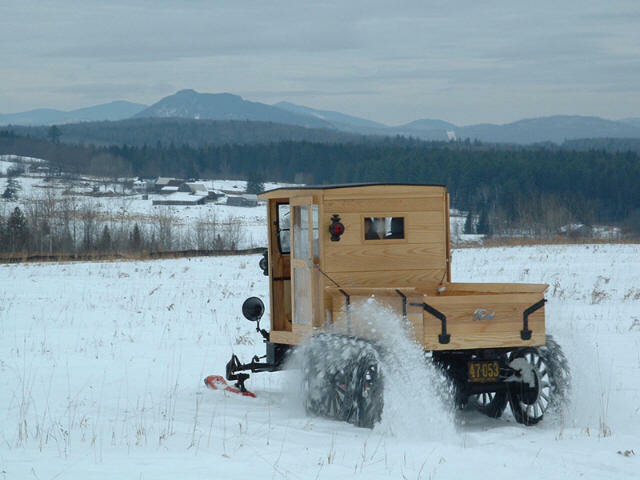 With the coldness of winter nipping at our fingers these last couple of weeks, thoughts return to the annual Model T snowmobile meet in New England. You can bet that Bob T. will be returning this year to see the beasts in action once again. 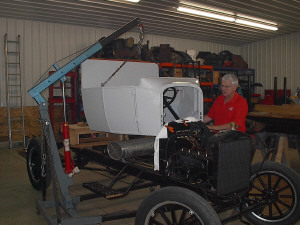 This activity seems like the perfect combination for Bob H. since two of his passions are Model T's and snowmobiles. This could be a great opportunity for a long road trip to New England. The New England winters can be intense, especially in the areas just off of the lakes. Snow fall amounts accumulate into the two to four feet region and make travel by conventional vehicles almost impossible. 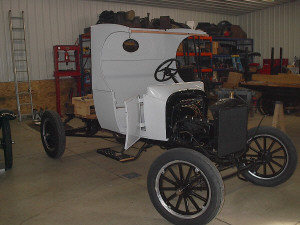 The Model T was the perfect candidate for modification because of its availability and ease of modification. 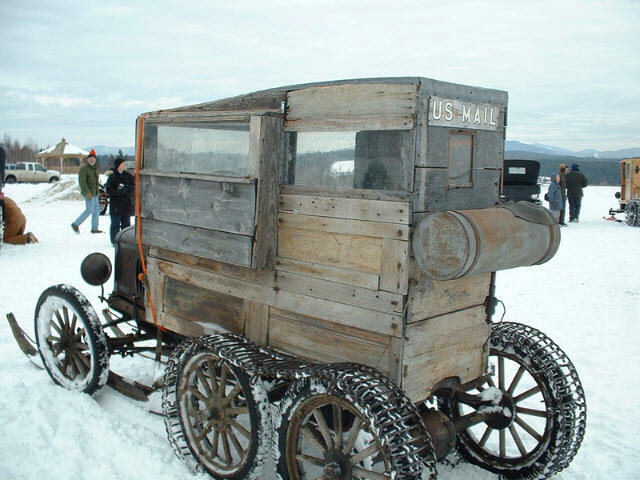 This US Mail Model T would have been used to get the mail to people on the back roads of Vermont or New Hampshire. This bed was found in the corner of a barn in NW Ohio. 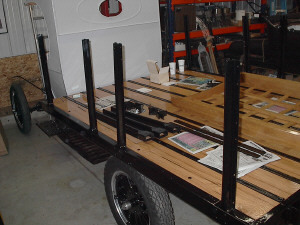 Only a trained eye could have recognized it as a Model T truck bed. This is how the C cab assembly looked at the November meeting. Eventually it will be ready for show.